High Gloss Light Grey is very fashionable and aesthetically pleasing. A High Gloss Light Grey finish on doors and drawers makes a major style statement. High Gloss Light Grey replacement kitchen doors and drawer fronts start at just £2.94. Click the button to request a free large sample swatch of High Gloss Light Grey. 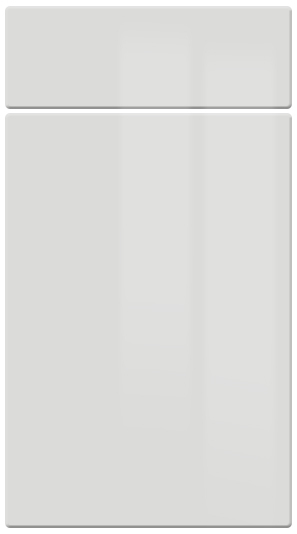 Click the button to purchase a Sample High Gloss Light Grey finish kitchen door. The High Gloss Light Grey finish is available in ALL kitchen door and drawer front designs. The High Gloss Light Grey finish is available in MOST kitchen door and drawer front designs. There is also a large range of High Gloss Light Grey accessories available. For example High Gloss Light Grey cornice, High Gloss Light Grey pelmet, High Gloss Light Grey plinth/kickboards and High Gloss Light Grey panels. Click the button to purchase a Sample High Gloss Light Grey kitchen cabinet door.